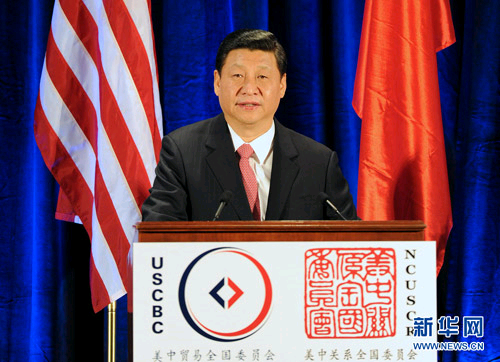 Chinese Vice-President Xi Jinping delivers a policy address during an event co-hosted by the US-China Business Council and the National Committee on US-China Relations in Washington February 15, 2012. [Photo/Xinhua]. WASHINGTON / BEIJING – Vice-President Xi Jinping called for an expansion of military ties with the United States amid tension over Washington building up its military presence in the Asia-Pacific region. During discussions on Tuesday with US officials, Xi also urged Washington to abandon trade protectionism and respect China’s fundamental interests. Meeting US Defense Secretary Leon Panetta and General Martin Dempsey, chairman of the Joint Chiefs of Staff, Xi said military ties are an important part of the relationship. Xi urged defense officials from the two countries to enhance dialogue, cultivate trust and accommodate major concerns to establish a mature military relationship. Military ties between China and the US can suffer turbulence, especially when the US insists on arms sale to Taiwan. US efforts to enhance its military presence in the Asia-Pacific, as well as frequently holding military drills with its allies, has added to tension between the two countries. During Tuesday’s meeting, US military officials said they want to enhance ties with China. "The US and China are Pacific powers … we want to work with China to build an open, transparent and inclusive regional security order," Panetta said. Pentagon press secretary George Little, quoted by the Wall Street Journal, said the two countries shared a "wide-ranging discussion" on military and security matters. . . .